Sam has a black long-sleeved T to go with his brown ones. Sam is really rocking the long-sleeves in S1. In Asylum (1x10), Sam wears it underneath his grey polo shirt from when he and Dean first investigate the asylum and on through the main action of the episode. He changes out of it before the final scene. Arguably, this could also be the black T that he was wearing under his Light-Blue Striped Shirt at the beginning of the episode as well. In Scarecrow (1x11), Sam is wearing this T underneath his red polo shirt during his attempted trip to California, and subsequently when rescuing Dean. In Dead Man’s Blood (1x20), this may be the T that Sam is wearing underneath his red polo shirt at the end of the episode when his Dad agrees that they should work together. He then leaves it on for the entirety of Salvation (1x21) and Devil’s Trap (1x22), and until his visit to Bobby’s to check on the Impala during In My Time of Dying (2x01). 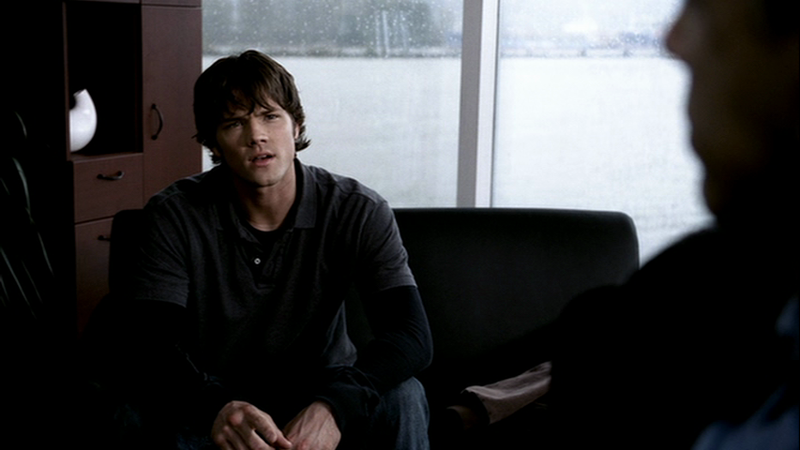 In Fresh Blood (3x07), Sam wears a black-longsleeved shirt underneath a polo in the final scene when he and Dean fix the Impala. Did u notice Sam wore this again years later in tonight's episode?